In an era where consumers are at the forefront of change, informed consent takes on added significance. As custodians of the legal EHR, HIM professionals need to pay close attention to the increasingly central role patients must play in the management of their own healthcare and the accompanying reams of data. Although accountable care organizations (ACOs) occupy only a few pages of the Patient Protection and Affordable Care Act, they have been vigorously discussed and spawned a group of consultants eager to help organizations looking to join the ranks. The Obama administration recently released more specific guidelines regarding how groups can become an ACO, whose goal is to engage and coordinate all its components to achieve superior care at lower costs. In the April 2011 edition of The New England Journal of Medicine, Donald M. Berwick, MD, MPP, discussed the launching of ACOs and the proposed rule for the Medicare Shared Savings Program, stating that “a critical foundation of the proposed rule is its unwavering focus on patients. We envision that successful ACOs will honor individual preferences and will engage patients in shared decision making about diagnostic and therapeutic options.” Patient engagement is the last cost-control bastion for healthcare organizations that have tried everything else to control spiraling healthcare expenses. HIM professionals should take note of Berwick’s emphasis on “information management, ie, making sure patients and all health care providers have the right information at the point of care,” since this will be a core competency of ACOs as Washington assesses healthcare compliance efforts. Alert HIM professionals are following the patient-centric trend in recognition that it will fundamentally transform the industry. Eric Topol, MD, director of the Scripps Translational Science Institute and editor-in-chief of Medscape Genomic Medicine and theheart.org, likens patients’ reluctance to take charge to when high priests or village elders in the Middle Ages would interpret written materials for the illiterate. The arrival of the Guttenberg Bible and an increase in literacy rates turned society on its head. The healthcare landscape is undergoing a similar revolution. Soon, patients will not have to rely on physicians or HIM departments to access their information. Electronic sources will help them interpret their data and make better-informed decisions regarding their care. Many HIM staff are working in organizations exploring the idea of becoming a patient-centered medical home, a model of care designed to meet the mounting challenges of value-based purchasing. The medical home, whose goal is to create cooperative relationships, features four cornerstones: primary care, patient-centered care, new model practice, and payment reform. The concept emphasizes patient-centeredness in a broader sense, placing consumers at the forefront of the healthcare system by expanding access and improving options for patient-clinician communication, such as the use of Internet “visits.” This will allow primary care to extend beyond the four walls of the traditional exam room and eliminate the traditional banker’s hours for various patient populations. At the heart of patient-centered care is the idea of informed consent. Engaging patients in their care involves true informed consent (ie, knowing all treatment options). Electronic, patient-guided consent technologies could have a profound effect on another emerging trend: evidence-based medicine. In The Journal of the American Medical Association article “Patient-Centered Care and Preference-Sensitive Decision Making,” Carla C. Keirns, MD, MA, MS, PhD, and Susan Dorr Goold, MD, MHSA, MA, define evidence-based medicine as “the explicit use of clinical trial data to guide clinical practice,” noting that “the movement toward patient empowerment through explicit informed consent, shared decision making, and patient-centered care” has resulted in conflicts. The alignment of evidence-based medicine guidelines and patient-centered care usually occurs because patients “value prevention of disease and disability and increased length of life.” However, Keirns and Goold have found that patients may decide to choose less expensive, less effective medication or a more limited operation, trading survival for quality of life. “[They can] decline chemotherapy because they feel the adverse effects are not worth the small chance of success,” the authors wrote. • The process was a haphazard mess. • Only about one in four forms went beyond a basic description of the procedure to include common risks, benefits, and alternatives. • The forms primarily were used as a risk management tool, a means to help avoid malpractice suits, instead of a mechanism to promote good decisions. Although a paper-based process can yield informed consent, an electronic version better fits in the current environment in which more providers are adopting EHRs. As more HIM professionals become data analytic experts, they’ll be better equipped to harvest information from electronic consent tools, improving the patient experience and potentially saving money for their organizations. • the ability to collect data from the consent process to demonstrate efficacy in helping patients make informed and value-based decisions. • Web-based services in both office and hospital versions. Used by the VA and several other healthcare systems, the software provides data on the number of consents completed compared with the number of procedures, who has documented the consent, and pre- and postoperative consent documentation. For quality assurance purposes, alerts are sounded if the consent changes. Kelly says iMedConsent can automatically feed completed consent data into VistA, the VA’s EHR system, as well as send images of the consent to the VistA imaging system. Dialog Medical’s procedure-specific consents, available in an array of surgical alternatives, are modeled on the World Health Organization’s surgical safety checklist. In addition, patients can review the consent via the Web. 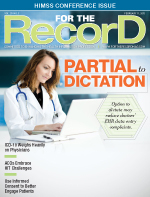 EHR vendors also offer physician- or patient-oriented informed consent processes. These electronic “sessions,” which allow patients to pause or review the consent, are designed to check for comprehension and flag any items requiring further discussion. The physician is notified if the patient pauses over areas or does not appear to understand the consent. It is then the physician’s responsibility to clarify any areas of confusion or concern. • I want to take medication to lower my bad cholesterol. • I would like to exercise to help me (a) lose weight, (b) lower my blood pressure, and (c) reduce my bad cholesterol. • I want to lower my blood pressure with a low-salt diet. Working hand in hand with their physicians, patients can interact with the electronic consent to select one or more of the treatment alternatives. In the meantime, while the patient is working through the consent process, clicking on different options, and making decisions, a series of metadata is collected indicating the type of information being accessed. Interactions and discussions with the physician are automatically documented, a benefit in terms of both quality of care and decreasing malpractice risks. For example, a would-be litigant dropped her malpractice charge against Stanford University Medical Center when she was shown that her pattern of computer clicks confirmed that she actually had looked at a screen shot describing her complication four times and discussed it with her doctor. Harvesting data and metadata from electronic consent management processes is a task tailor-made for HIM professionals, whose ability to understand analytical concepts increases as more providers move away from paper. Data collection allows the consent process to be more precise and productive, yielding information on whether informed patient consent actually leads to more cost-effective healthcare decisions. The Office of the National Coordinator (ONC) for Health Information Technology defines consent management systems as those that “allow patients to communicate their privacy preferences and control who can view their personal health information.” According to the ONC’s Privacy and Security Tiger Team, computerized consent management systems allow patients to exert greater control over the privacy of their health data. In that regard, the VA and the Department of Defense are moving into more advanced levels of patient engagement by establishing the Virtual Lifetime Electronic Record, a community data-sharing project that allows patients to control access to certain elements of their medical records, including diagnoses, laboratory results, and medication lists. The system also groups sensitive data so patients can manage all elements of their records through a single consent control. The power over the information moves fully into the patient’s hands all the way down to the data element level, allowing for specific release of information. The consent management domain is evolving to embrace ethical issues such as potential conflicts between patients and physicians regarding treatment choices. A patient’s course of action may differ from the path taken by a physician who’s more concerned with administrating treatment that follows evidence-based care guidelines. Physicians also must be aware of how their actions affect pay-for-performance bonuses. Issues surrounding genomic research also come into play. For example, is deidentification of patient data enough to assure patients their data will remain private? No matter how these issues are resolved, HIM professionals figure to play a significant role in the future of electronic patient consent. Domains such as data analytics, health informatics, and information governance fit snugly into their areas of expertise. In addition, their backgrounds can help make decisions regarding how to properly use the harvested data.